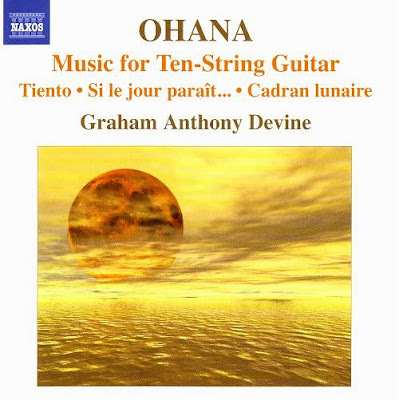 ... Ohana's imagination created a unique, complex and highly intense musical language which makes immense demands on both player and listener. Naxos deserve two very big thank yous. The first for treading where other major labels fear to go and releasing this outstanding CD of the guitar music of Maurice Ohana (1913-1992), complete with dazzling playing by Graham Anthony Devine and first rate sound from the St John Chrysostom Church, Newmarket, Canada. The second big thank you is for having the courage to put the words above on the CD sleeve. Naxos are famous for swimming against the tide. But, in an age where the increasingly frantic search for accessibilty makes it almost obligatory to remove any demands on the listener, it still takes courage to tell customers that they are in for a difficult listen. A scientist was watching a monarch butterfly emerge from its cocoon. It was such a long struggle, the creature fought on and on with the rough material of the cocoon - tearing, pulling and struggling, fighting to get out. "If I only snip this little bit at the top, I could help this creature," the scientist said to himself. And he reached with his scissors and cut away the last piece of the cocoon. The monarch went on for a few moments, but seemed to grow weaker, and finally, his wings still partly folded, he fell back onto the table, dead. The scientist realised he had killed the butterfly by trying to make things easier. Each push by the struggling insect forces lifeblood into those glorious wings, and their beauty in flight comes only after the fight to emerge from the cocoon is entirely finished. Judy Collins studied with Antonia Brico, who was the first woman to conduct the Berlin Philharmonic Orchestra. Read the story of that remarkable lady, who had more than her share of struggles, here. 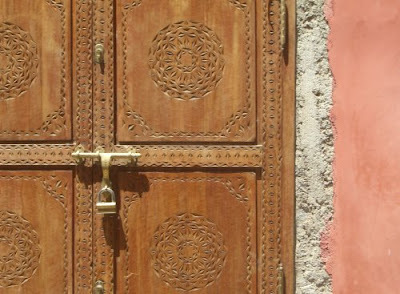 The photo above comes from my 2008 article Unlocking the music of Maurice Ohana. I, for one, had never read or heard that powerful parable of the scientist and tbe cocoon. Thank you, pliable. Last Sunday we saw, in Washington, D.C., a beautiful deep reddish monarch butterfly which must have been preparing for her or his travel to a winter home in the Sierra Madre Mountains of Mexico (or, less likely, the Florida Keys). I see now that monarchs are the only butterflies known to make a two-way migration as do birds, and that unlike other butterflies, monarchs, in their larvae or papae stage, cannot survive the cold winters of northern North America. Garth, you are fortunate. The only places that the monarch butterfly is resident in Europe is on the Atlantic islands a long way south off the African coast. It is only found as an occasional visitor in mainland Europe due to the climate. There is an interesting wildlife thread here. The photo I used in yesterday's post was taken by me at the Lac du Der Chantecoq in the Ardennes-Champagne region of France last week. The Lac du Der was created in 1973 as a flood prevention measure to stop the River Marne flooding Paris. It is Europe's largest man-made lake and is a massive nature reserve which is home to 20,000 migrating cranes in winter. We were too early to see the cranes, but we rode out to an isolated beach that was inaccessible by car on our mountain bikes and saw the most amazing bird life. This included many beautiful Great Egrets, which, I think, are quite common in the southern states in America.